Historical revisionism in the schoolbooks of the former Yugoslav Republic of Macedonia (FYROM). 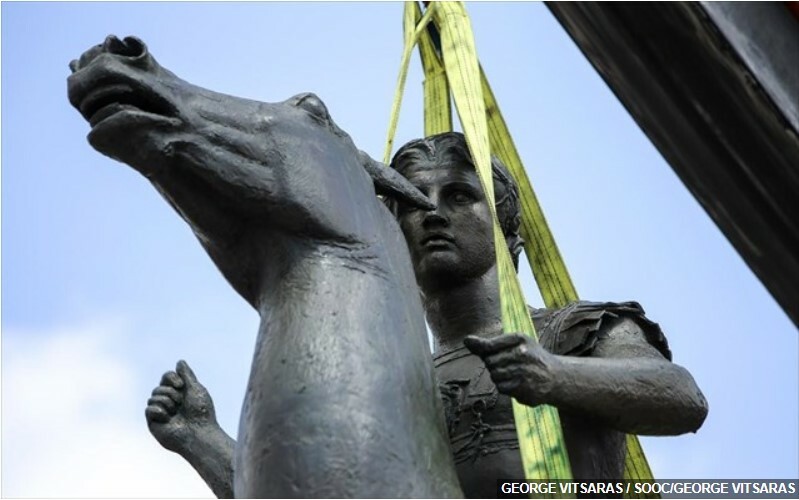 Part 1: The reinvention of ancient Macedonia. Schoolbooks in the Former Yugoslav Republic of Macedonia consistently represent Macedonia as encompassing a region that consists of FYROM, the Greek administrative district of Macedonia and parts of other countries. An astonishing fabrication of history teaches schoolchildren that these borders of “Macedonia” existed from antiquity and that their country was “dismembered” and Macedonians underwent a genocide by the Greeks. Indeed, young children in the Former Yugoslav Republic of Macedonia are taught through their schoolbooks that Macedonians were a non-Greek people that have inhabited the land of Macedonia continuously. They are taught that this exact land as shown in the maps of Greater FYROM, was exactly the same as that inhabited by the ancient Macedonians. The boundaries are shown again and again in their schoolbook maps to have remained the same from antiquity! These schoolchildren are taught that the Greeks expelled the “Macedonians” from the “Aegean” part of this country in the middle of the 20th century. Generations of poisoned minds have since the days of Tito and again since 1998 been taught to believe that Greeks expelled their “Macedonian” but Slav speaking forefathers from their ancestral lands in some kind of genocide – that mysteriously no international organisation ever recorded. Raised with this kind of modern myth, it is no surprise Greece is faced with an insistence that their country (FYROM) should be named Macedonia and that no other name would be acceptable to them. It is sad but true. Furnished with this kind of evidence, one is convinced that people can be raised in schools to believe in anything whatsoever, and to be poisoned as children to hate a people for imagined reasons. Unfortunately, this tactic of the FYROM government also revives the expansionist policies of Tito against historic Macedonia (in Greece). 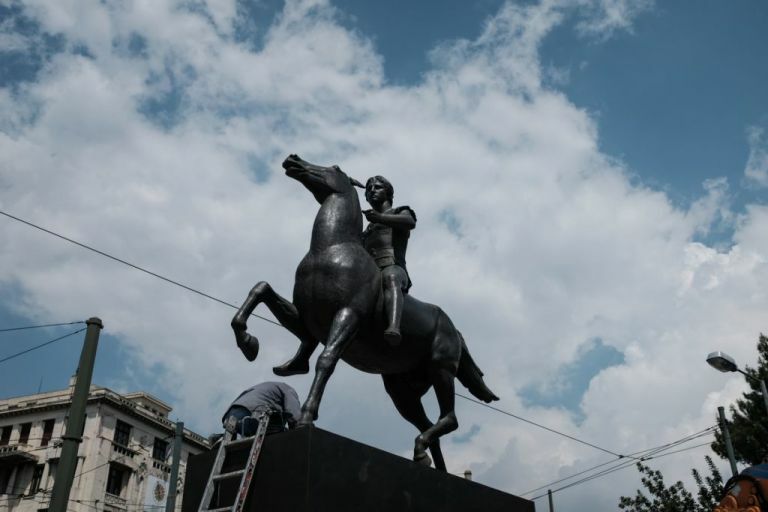 It reveals a sinister side in the claims of FYROM on Macedonian history and heritage despite assurances made to the United Nations prior to the Interim Agreement. These aggressive policies are carried out at a time when FYROM paradoxically wants to join the European Union and NATO – of which the invented enemy Greece is a member. Even more ironically, the current FYROM government claims and says to NATO that this policy of inciting ethnic hatred against Greece (and suitably inventing history schoolbooks for this purpose) is in the interests of peace in the region. In the school books, there is again and again a map of Macedonia with fixed borders. It includes not only FYROM but also the present administrative region of Macedonia in Greece and parts of Bulgaria and Albania. 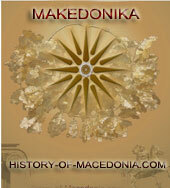 This “Macedonia” is shown unaltered from times immemorial. Something like this type of map appeared for the first time in an ethnological description in 1899 by a Greek named C. Nicolaides and had formed the Greek view for the 1913 Bucharest Treaty discussions regarding the ethnicities in the region. It was an attempt at depicting the ethnic constitution of a part of the Balkans. It did not represent of course a country. The region shown was part of a larger area under Turkish rule. It was not a map of a country. Such a “country” did not exist in 1899. A country with such boundaries had never existed before. Below are three maps of the Ottoman vilayets of Salonik, Manastir and Kosova. FYROM mostly consists of parts of the later two. Nowhere in the Turkish maps is there any indication of a Macedonia. No such map can be seen either. Yet such a Macedonia, belonging to the FYROM schoolbooks was allegedly partitioned or dismembered by the Balkan nations during the Balkan wars! 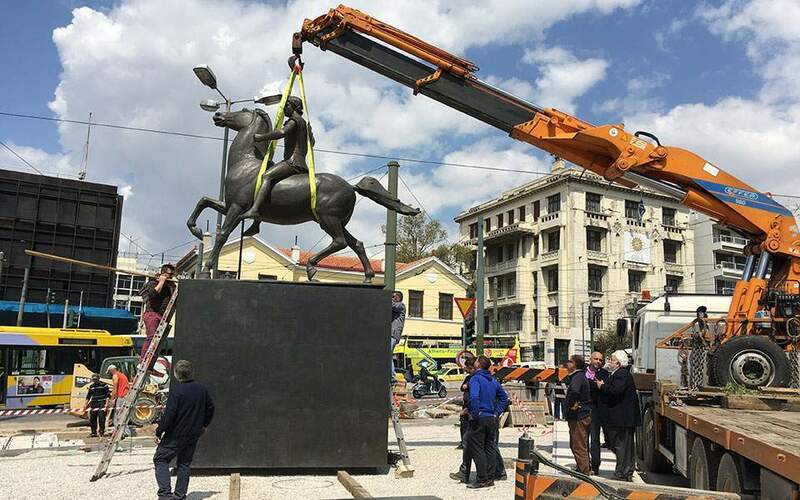 It is surprising that the level of miseducation and the hatred it has engendered stop people in FYROM from looking at this paradox and realise they are applying WWII propaganda as historical truth backwards to 1912 and beyond. The ethnological map of Nicolaides moreover made no reference to a Macedonian ethnicity. The ethnicities were clearly labelled as Serbian, Bulgarian, Greek, Albanian and Turkish or Muslim (as in the Turkish censuses of around the same time). The FYROM propaganda kept the map as a map of “Macedonia” in the schoolbooks, but changed all ethnic groups into one: the Macedonians. These are now claimed to have existed from time immemorial unchanged, although quite paradoxically the Slav Macedonians of FYROM are Slavic speaking and have no established cultural, religious or other connections to the ancient Macedonians. Then in the mid-20th century a completely unreported genocide apparently took place that wiped out these ancient FYROMacedonians from Macedonia in Greece. 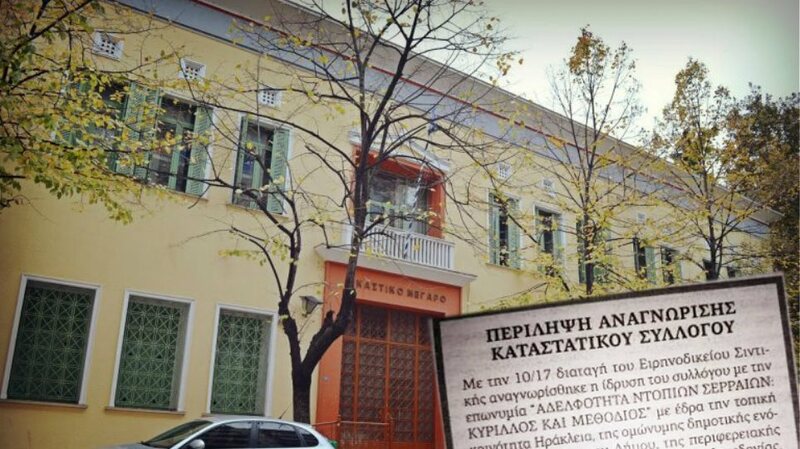 Let us have a look at some of the unhistorical claims made by the FYROM schoolbooks (mainly from 1997-2006, still being used at least as late as 2007). The first map shows the arbitrary map of a Greater FYROM closely modelled on the Nicolaides ethnological plan. It contains exactly modern Macedonia (in Greece), the former Blagoevegrad district in Bulgaria and FYROM. These boundaries were only fixed and recorded for the first time at around the time of the first world war. “Greater FYROM” appears as a distinct geographical unit in prehistoric times with Slavic cities. This unhistorical map is from the «Istoriski Atlas», Skopje 1998, pg. 10 and the «Istoriski Atlas», Skopje 2006, pg. 10. This Istoriski Atlas is used in schools in FYROM to educate children on how to hate their neighbours. The next schoolbook map is of Greece from the period around 6-5th C BC. 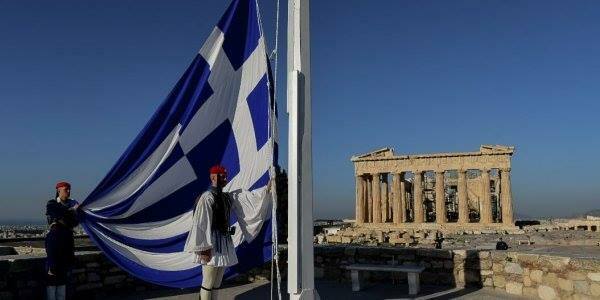 It describes the colonies of Greeks and Phoenicians. Macedonia is labelled in pink as a part of Greece and encircled correctly. The map is from Istoriski Atlas, Skopje from the year 1992 (page 8). More recent maps have Macedonia outside Greece and the word “Macedonia” actually outside Macedonia. It is instead written suitably over the region of the central Balkans! Below is such a map from the 5th Grade Primary School History book in FYROM by Kosta Adžievski, Darinka Petreska, Violeta Ačkoska, Naum Dimovski and Vančo Gjorgjiev, Istorija za petto oddelenie, Skopje 2005, pg. 37. The map is entitled “The Colonies of the Greeks”. In this map “Macedonia” is written outside Macedonia, in a void in the middle of the Balkan peninsula. Paradoxically, the historical region of ancient Macedonia, where the Macedonians actually lived, is here correctly labeled in pink along with the other Greek areas and colonies – but is not called Macedonia! In the 5th Grade Primary School History book (Kosta Adžievski, Darinka Petreska, Violeta Ačkoska, Naum Dimovski and Vančo Gjorgjiev, Istorija za petto oddelenie, Skopje 2005, pg. 39) we find another map entitled “Athens and Sparta”. Presumably Greece is the pink area and Macedonia was outside Greece (same with Crete, the colonies in Asia Minor, many of the islands, etc). The appearance is like intending to say “go back to Greece, the pink area”. FYROM propagandists often claim that Greece stops in Thessaly, this is the clear effect maps such as this have in the mind-frame of children in FYROM. A map from the Roman period also from the 5th Grade Primary School History book (Kosta Adžievski, Darinka Petreska, Violeta Ačkoska, Naum Dimovski and Vančo Gjorgjiev, Istorija za petto oddelenie, Skopje 2005, pg. 79), in its section on “The Roman State during the 1st century A.D.” is showing Macedonia and Greece as separate Roman provinces. Though factually correct, this echoes the FYROM dogma of two separate countries with different people. They were actually separate Roman provinces and indeed the Romans had incited constant wars between Macedonia and some of the other Greek states in an effort to weaken and conquer all the Greeks. It was the very tactic that led to the proverb “Divide et impera” (divide and conquer). For modern FYROM propaganda it is evidence that the Greeks were different from the Macedonians – even though the inscriptions, city names, peoples´ names, customs, religion and festivals were everywhere Greek. It is not clear what continuity is envisaged between the prehistoric and ancient Macedonians and the Slavs. The following map shows the Slavic settlement in Greater FYROM. It is another school map from the Istoriski Atlas, Skopje, 1997, pg. 33 that describes “The settlement of the Slavic tribes in Macedonia”. The Slavs and Huns ransacked most of the European side of the Byzantine Empire, until they were repelled to the regions beyond the Ceraunian mountains and settled the area known as Illyricum (part of modern Yugoslavia). Byzantine Greeks from the eastern dominions were settled in the depopulated areas after Byzantine rule was re-established. What do these Slavs who were for the most part cast out of the empire have to do with the Macedonians? They murdered and pillaged the inhabitants of Macedonia for sure. Did that make them Macedonian? What is the connection? The unhistorical map of this fictitious “Macedonia” of the Slavs of the 6th century AD is again exactly the same as the modern maps of Greater FYROM. This schoolbook map shows the “The intrusion of the Normans and the Crusaders into the Balkans and Macedonia” (Istoriski Atlas, Skopje 1998, pg. 63. Istoriski Atlas, Skopje 2006, pg. 71). Macedonia is shown as a Slavic country with Slavic place names, covering the entire area of Greater FYROM down to Mt Olympus. The Normans in fact fought Emperor Alexius I Comnenus, referred by them as Imperator Graecorum. Nevertheless, here they are shown invading presumably not Byzantium but medieval Slavic Greater FYROM. A subsequent map has the name Macedonia written over the region of FYROM. This is the actual source of all these revisionist maps of ancient and medieval “Macedonia” in the FYROM schoolbooks. It is the actual origin of all the maps of Greater FYROM and the only truly historical example, but unsurprisingly it does not appear in the schoolbooks. That all the other maps showing Greater FYROM are fictitious and the last map is the actual original can easily be proven since no real historical maps show anything like it and the Nicolaides map does not refer to Macedonians as an ethnicity or Macedonia as a country. The fascist map above the portraits of Adolf Hitler and King Boris of Bulgaria is the inspiration for the endeavor by the Bulgarians, later by Tito and now eventually by FYROM schoolteachers to rewrite history and national boundaries. We normally regard education as liberating and a means of learning and transmitting knowledge freely. We consider education a civil right. Sadly there are examples, especially in former communist countries, were education simply meant the indoctrination of the population to a new version of history where truth was what the party wished it to be. This is no way of facing the future. Are the political leaders and miseducators responsible for this poisoning of children´s minds really prepared to face the challenge of entering Europe? Of entering NATO? Can they face the judgement of future historians? The last map photo is missing. Excellent article otherwise.